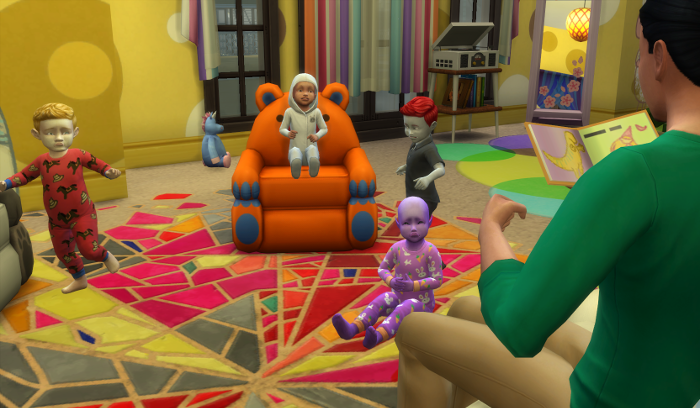 Over the weekend I attempted TheSimSupply’s 7 Toddler Challenge – and you could follow along with the shenanigans. But twitter is not a good archive and for those of you who missed it, here’s an overview of how the challenge went. Our fearless caretaker was Guppy Pigglewiggle. 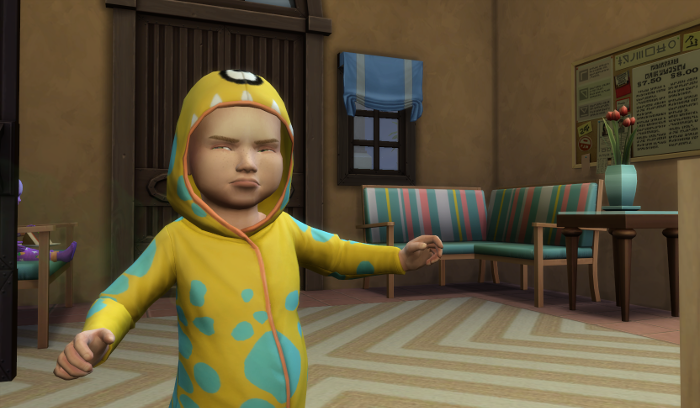 Gen 10 heir from my Pigglewiggle Legacy and not much else. 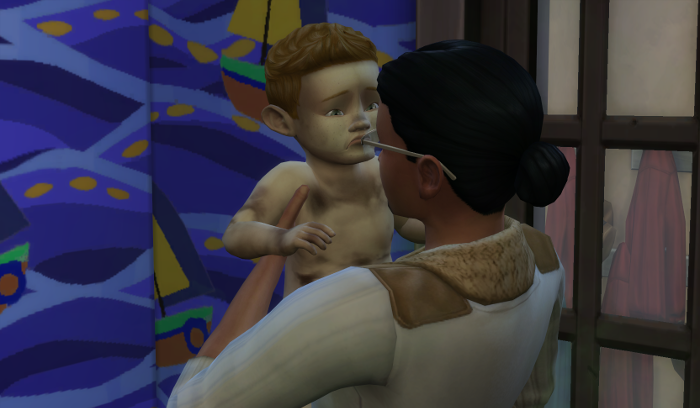 He’s hung around with my himself in Windenburg, but hasn’t really had a chance to shine. This is his chance! 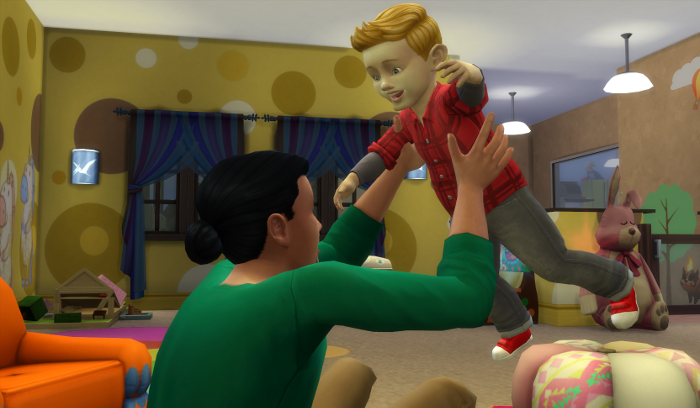 Guppy never actually grew up – once he was born, the legacy was over so he’s pretty fresh out of CAS. 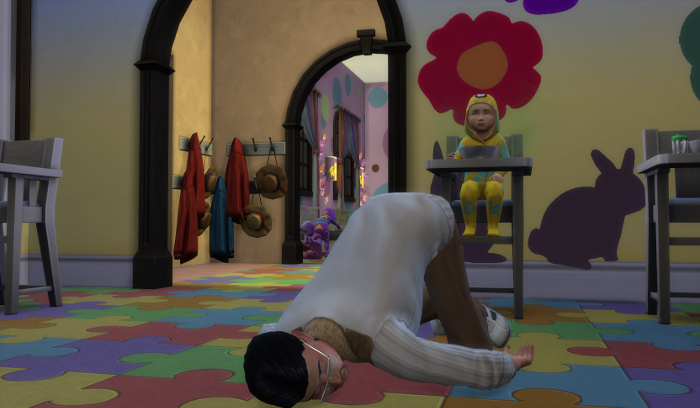 The poor guy spent half the time passed out on the floor with toddlers running all around him. 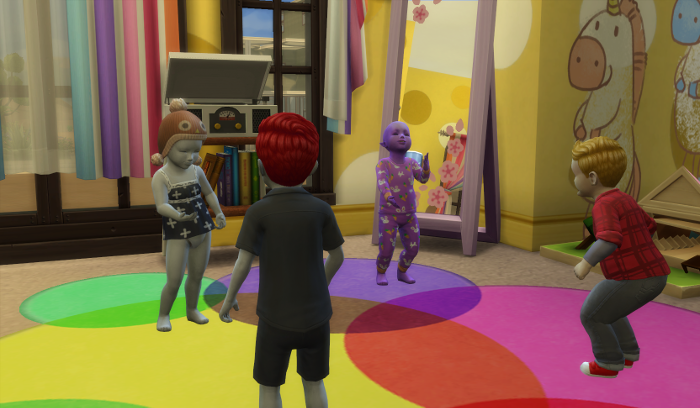 Next, let’s meet our toddlers, perhaps you recognize some of them? Arturo and Sam Huffman founder and first heir from the Huffman Legagy: Not a Prettacy. We made Artruo fussy to match with his future squeamishness and Sam was wild to match his active nature. 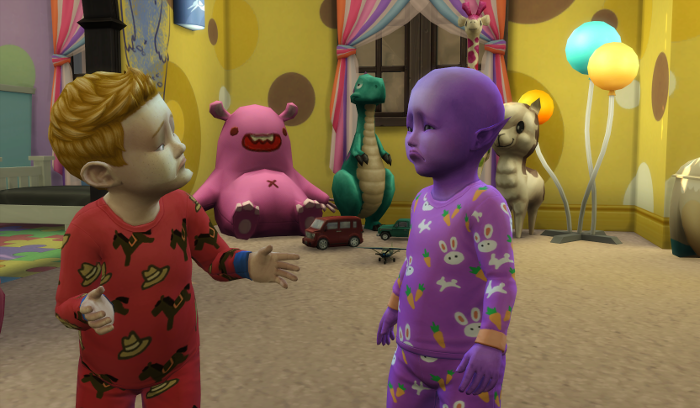 These two are the most distinctive toddlers. Look at Arty’s ears!! Although it’ll probably be restarted after an almost year hiatus, I still have great hopes for Adam Childe’s Apocalypse Challenge: Rebirth. As befitting a Wonderchild as well, he is inquisitive and by far our fastest skilling toddler. 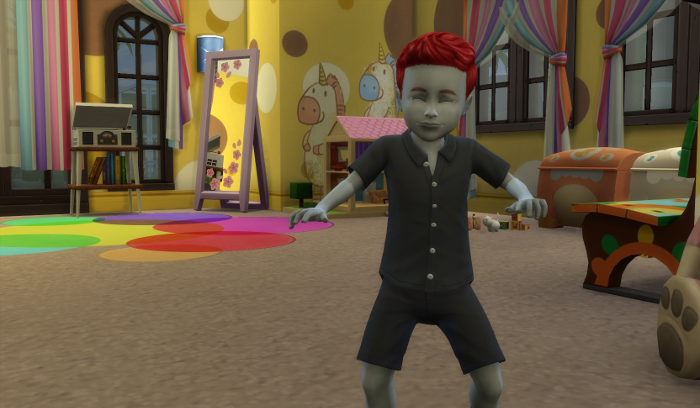 I have always loved his bright red hair – yes, it’s natural since he’s a hybrid sim. 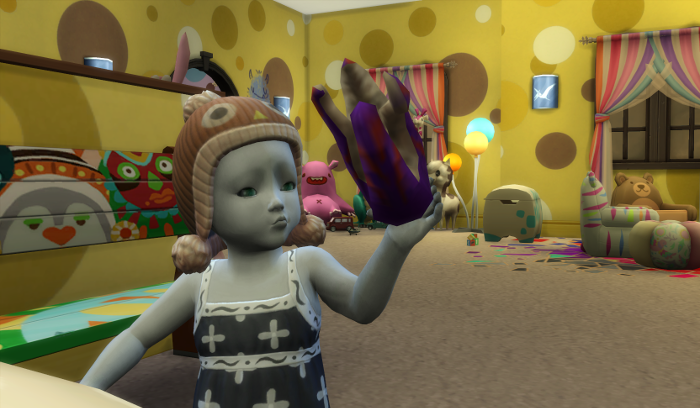 Amelia Echo from the room challenge story: Derelict also had a chance to explore toddlerdom. 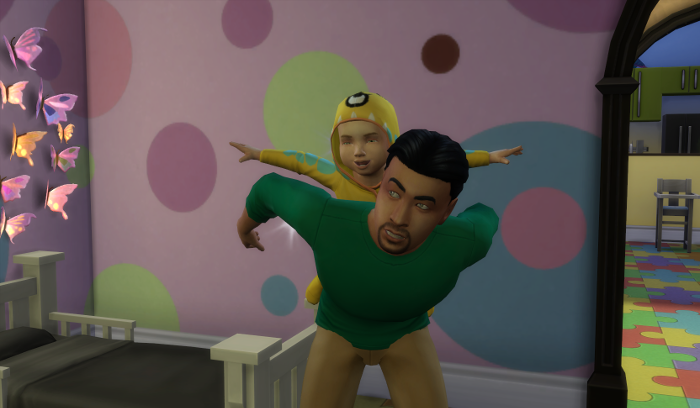 Since she’s going to be abandoned on a spaceship for years at the tender age of 14ish, we had her try out the clingy trait. I cannot get enough of this poofy hair. Normally though, Amelia wore white. 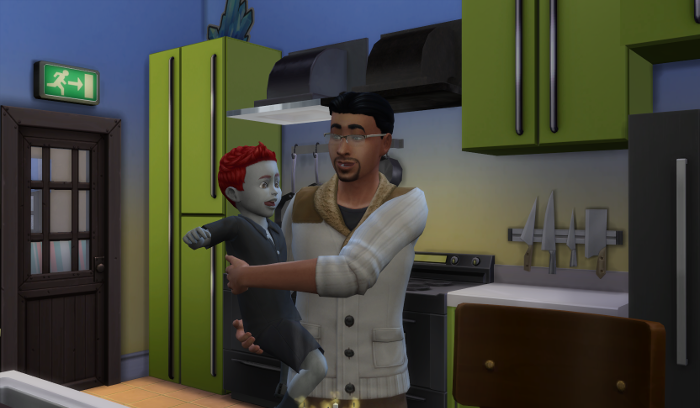 Of course how best to torture myself and Guppy, than to toss my simself into the mix? I was not a good playmate although Mina and I were friends, I ended up being enemies of the Huffman boys. So much so that Sam and I despised each other. 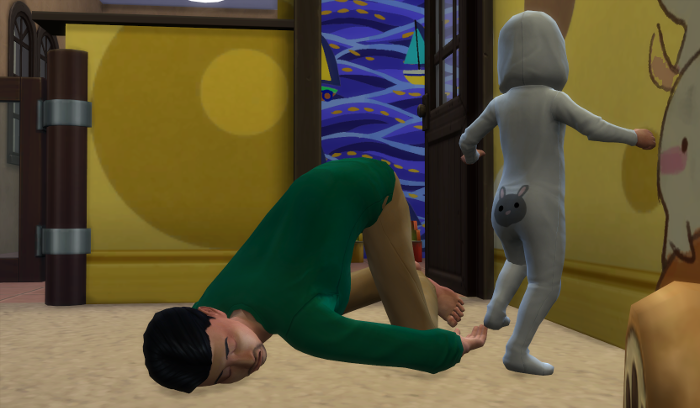 True to nature, I gave my simself the independent trait and managed to potty train myself without any help from guppy – just barely. I spend the majority of this challenge furious at one thing or another. Mina Pigglewiggle from gen 7 Pigglewiggle Legacy who also has been spending a lot of time with my simself. Mina was clearly our resident charmer. How could you say no to her face? 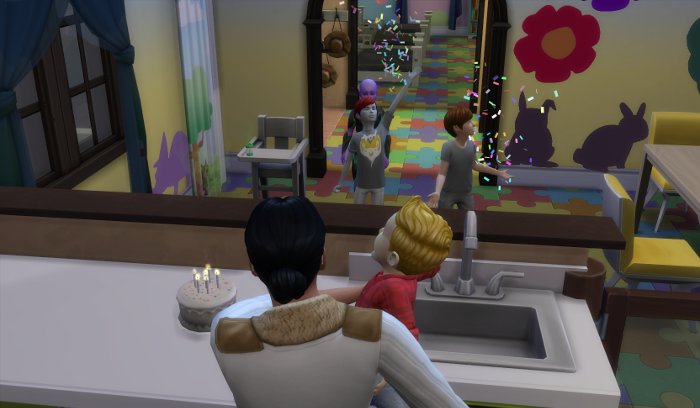 She was by far the chattiest sim and became friends with most of her playmates. Julia Pigglewiggle could be considered a gen 11 Pigglewiggle as well, but she’s our main character in the ambrosia challenge story: A Ghost of a Chance. 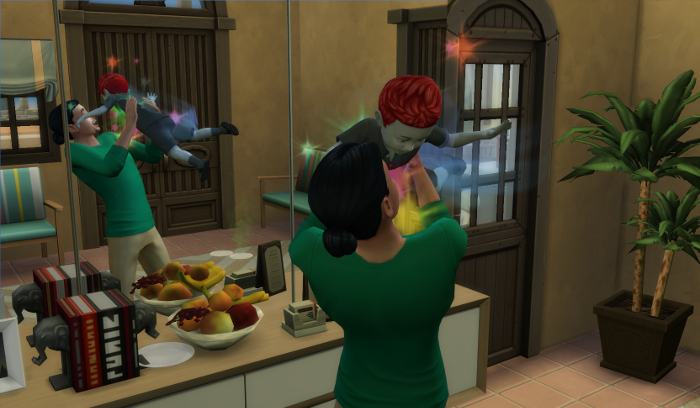 Since she’s working to revive a ghost at no small cost to herself, I gave her the Angelic trait. We would have added James, but ghosts can’t be toddlers. 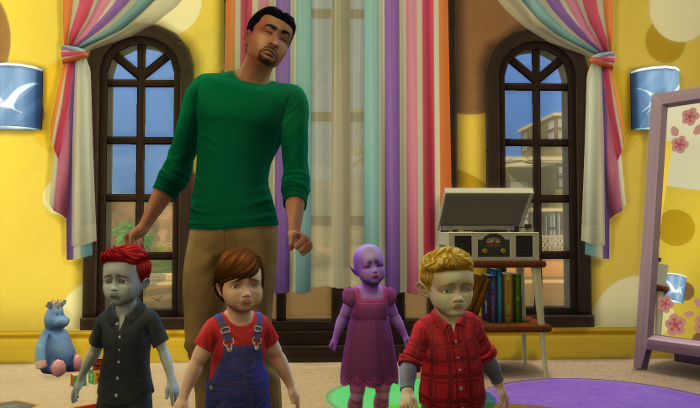 Those were my original 7 toddlers. The rules to this challenge? There are some official rules, but basically it’s a fun way to be overdosed on toddlers. 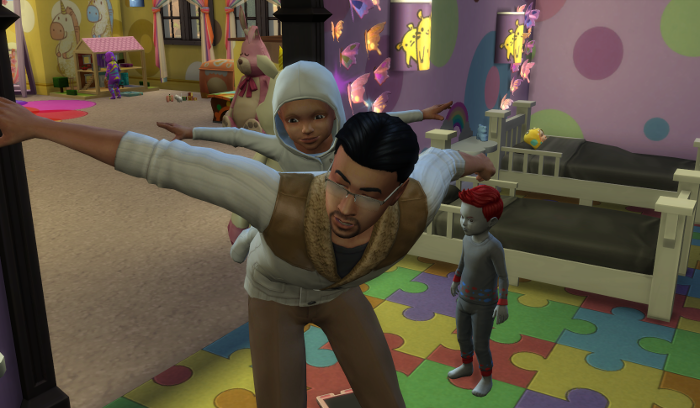 I had 7 toddlers and one adult to care for them. In my own opinion, you’d lose only if someone comes to take away a toddler. You “win” when they age up to children. I did hire a maid to help pick up the billions of dishes that accumulated, but I didn’t have a nanny or a butler although they are permitted. Maids will mop and clean up toddler toilets. They will also pick up dishes and take out the trash. They will not take dishes off high chairs and they will quit unexpectedly on Monday. This is maid number 2. 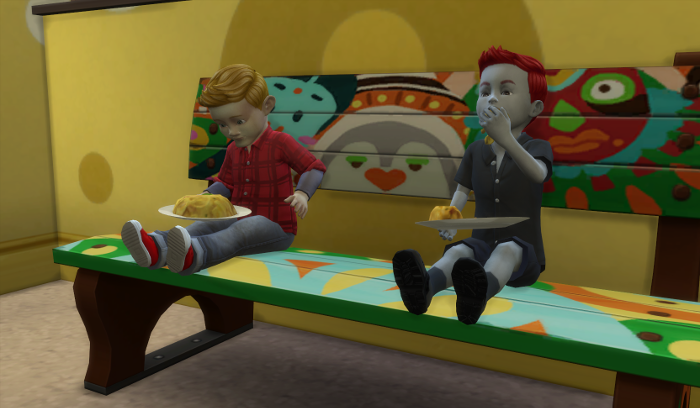 You noticed I said “original” 7 toddlers, eh? 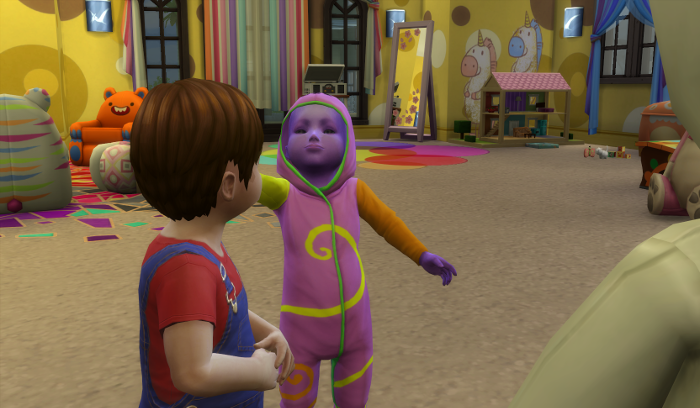 No, I didn’t have any taken away but several of my toddlers weren’t “fresh” CAS toddlers. They were grabbed off the gallery when I uploaded families and so were already older than the others. 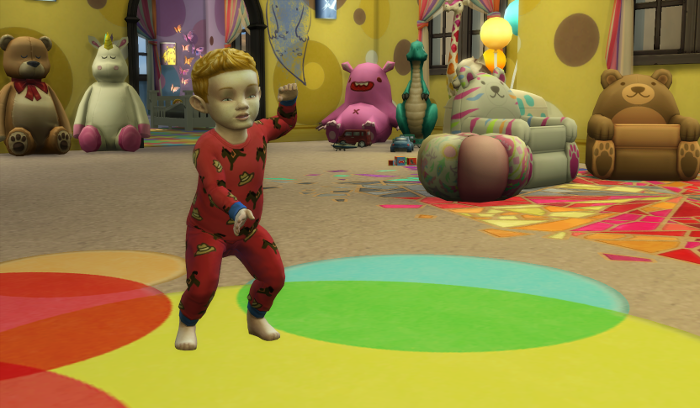 To keep the 7 toddler spirit going, as they aged up, I added new toddlers. And when my remaining original four were ready to age up, I called it quits. Here are the extra three that I added. 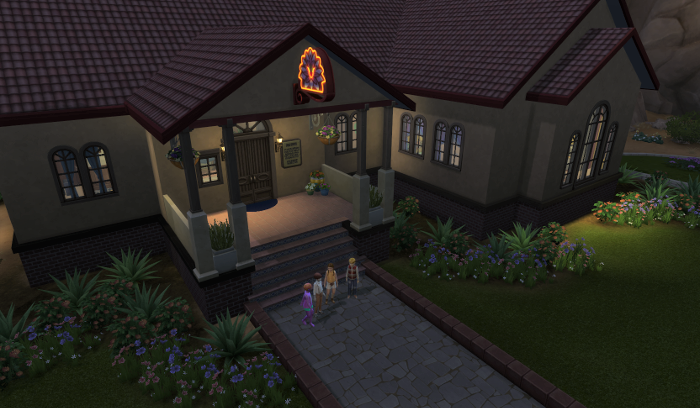 It was a bit of a challenge to find single sims that I could add to this already quit-full house. Shannon Drifter was my house 001 Drifter and when I’m bored is in charge of the Burning Bowl restaurant. They were less than ecstatic to join this crazy house. I made Shannon silly since I hadn’t used that trait before, but it didn’t really fit. Sorry! They were added when Sam Huffman aged up. Shannon had a hard time here since everyone else (at first) was so much more skilled and independent. 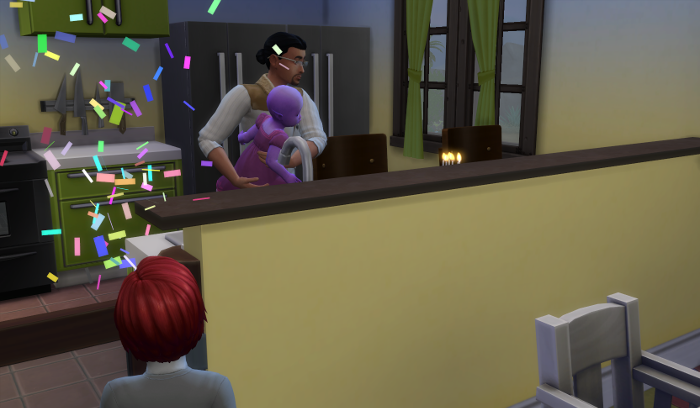 Penelope Pigglewiggle (I know, I know, another Pigglewiggle, but I have 10 generations of the things, I’m not going to run out that easily) was my very first in-game alien birth. She’s generation 7, but not from the Legacy save. She was born in the Sidelines: Get to Work spin-off story and also attended Cathy Tea’s Animal Hat camp (hence the animal hat) and her and oneZero will one day soon finish their Adventures. She got added after Julia aged up. 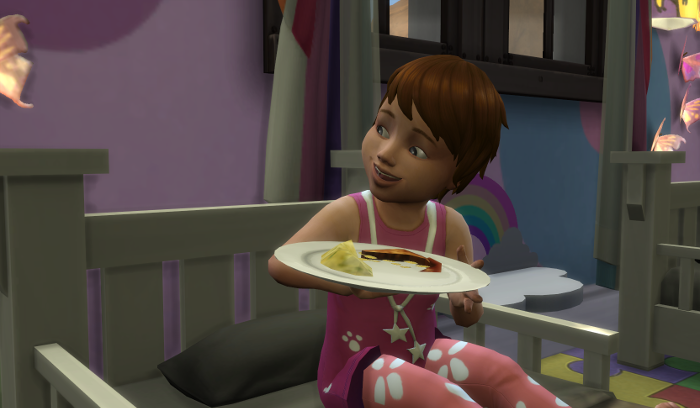 Penelope got to be a repeat trait: Inquisitive, because I spoil my favorite sims. 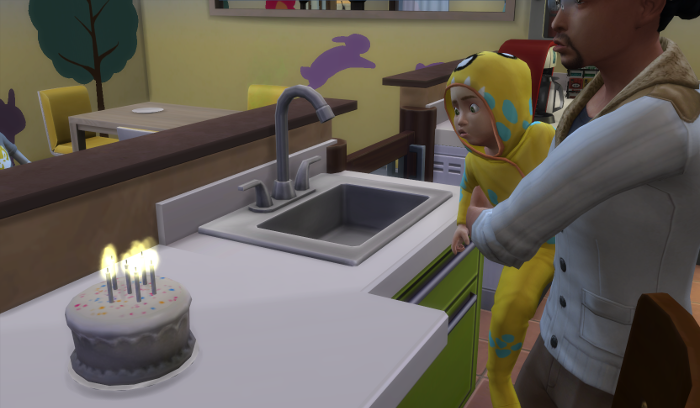 Lastly, when Amelia aged up (a mere two days before the end) I had to add one more sim and I was really struggling to find one in my gallery. Had I gone into my saves, I would have found many more sims, but I was trying to add them quickly. 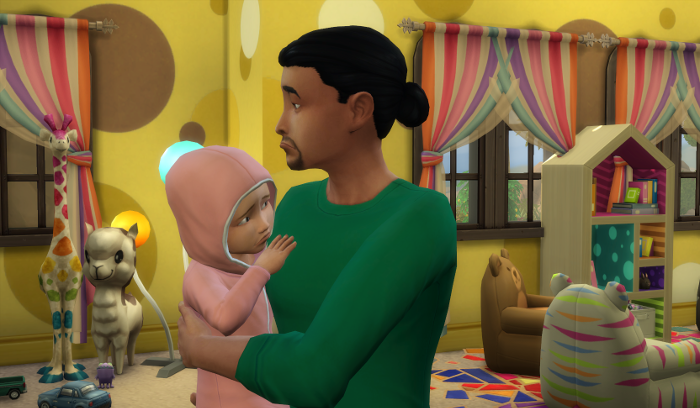 So I added Cocoa Pigglewiggle, Penelope’s dad and the last Pigglewiggle with our founder’s green-green eyes. He was born in our legacy house, but with his two cousins struck out for the Sidelines story. He was a fairly cheerful one, at least at first. And look at those big green eyes. He was wild like Sam had been. So there you have it. All the players in this mad-cap challenge. So, you ask, how did it go? It…went…well, we survived. Even Guppy who got to be in the green for sleep once (and only half green) during the entire event survived. Sometimes everyone even managed to get out of their pjs. Sometimes we managed to train the kids. But mostly they were left to dance and talk to themselves while Guppy cooked meals and bathed stinky kids. I highly recommend eschewing high chairs and toddler food. The kids will eat anything. And if the food is left out – they will grab it off the counters. Napping is a very popular activity. 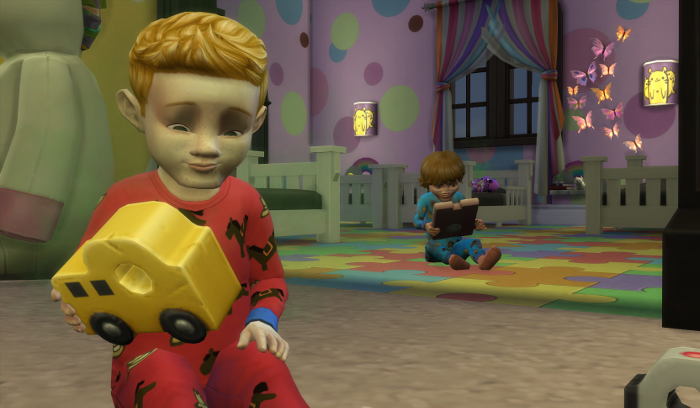 Kids tend not to go to bed on their own at first. We never had any idea what time of day it was. Night? Day? If the kids were awake Guppy was awake and unfortunately 9 times out of 10 at least one kid was awake and in need of major attention. Julia and Guppy both sad and pouty. I don’t remember why, but I think it’s super cute. 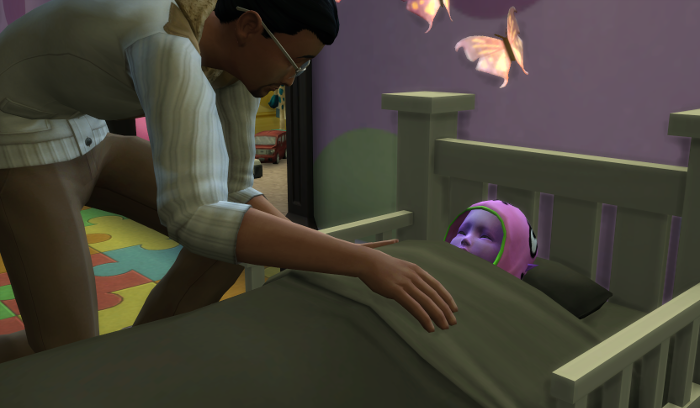 I think he’s actually taking her to bed for once. 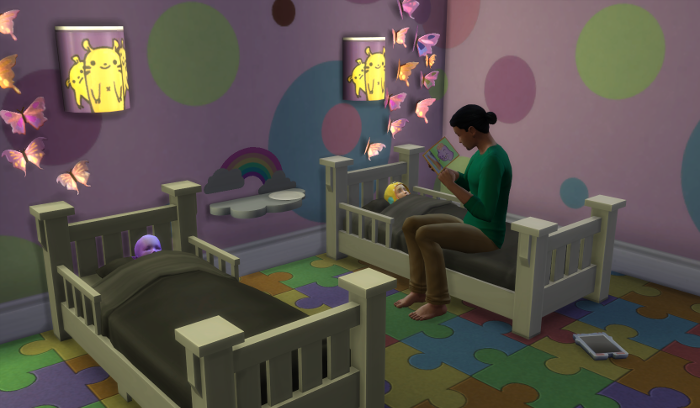 Tucking kids in and reading them to sleep is high-level toddler care. Most of the time we didn’t have time for that. It was one emergency after another. I wish we’d had time for proper bedtimes more often. It’s just too cute to watch. “There’s a fire there, there, there! 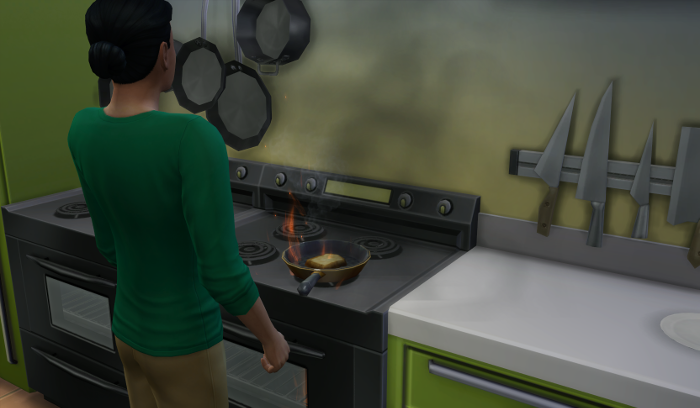 This is why I don’t cook!” Screams the caterer. Sigh. Then right near the end of our challenge was fire number two. I thought we were done with danger. 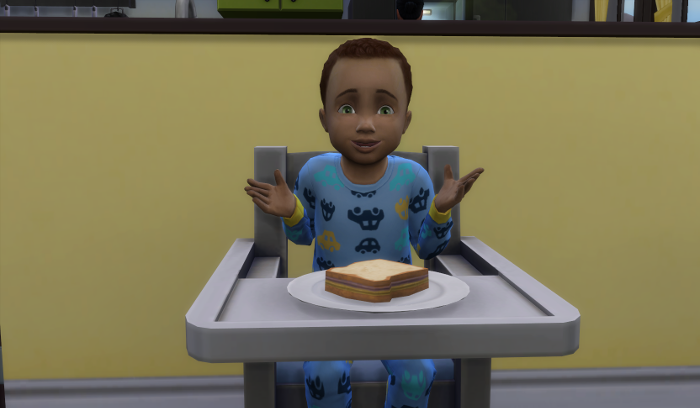 On the plus side, I think all 350 of Guppy aspiration points that he got during this challenge were from cooking family meals. I’m sorry Guppy. If the kids wake up in the middle of the night with a nightmare, they can’t go back to sleep – but they can nap. And no, the monster be gone lights does not work to avoid nightmares. 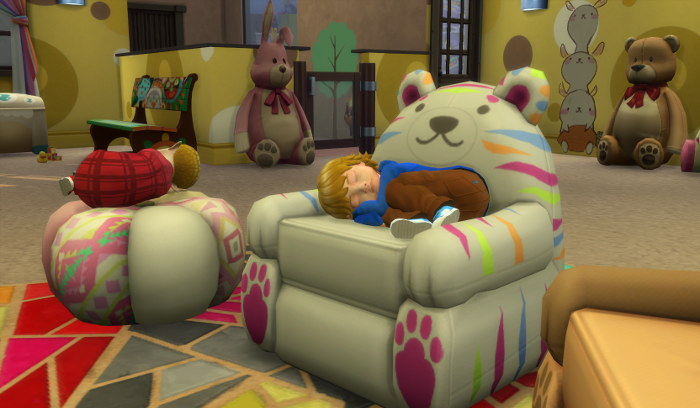 Seven sleeping toddlers. Like dwarves or bears – only more terrifying. It never lasts. I do wonder if they were tucked into bed more regularly if they have fewer nightmares. 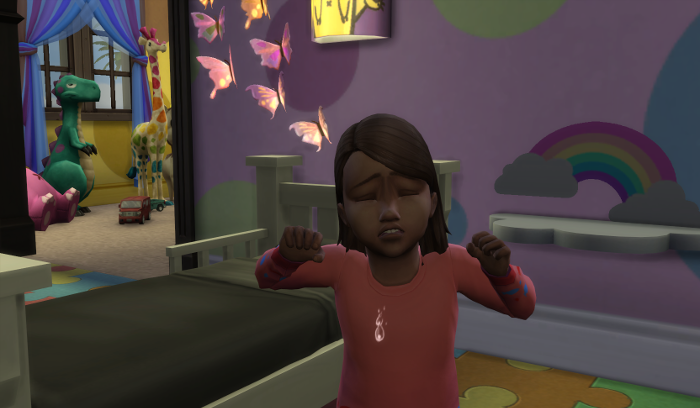 Very few toddlers made it through a whole “night” without waking up crying. And stinky. Did I mention that without potty training aggressively only one of our children was potty trained early. Tandem training! Actually, that’s a lie. 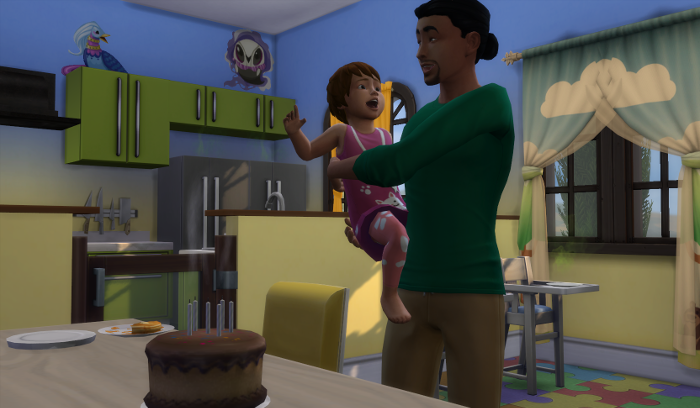 Adam was already level 2 and Raerei, being independent would always be willing to try to learn on her own. So many baths. So many. We get one set clean and then the next set would be ready for their baths. 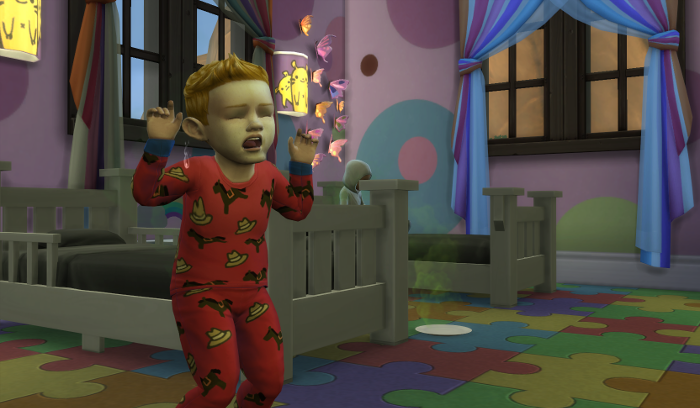 And stinky toddlers are not (often) happy toddlers. And when toddlers are unhappy, they let you know by throwing fits. 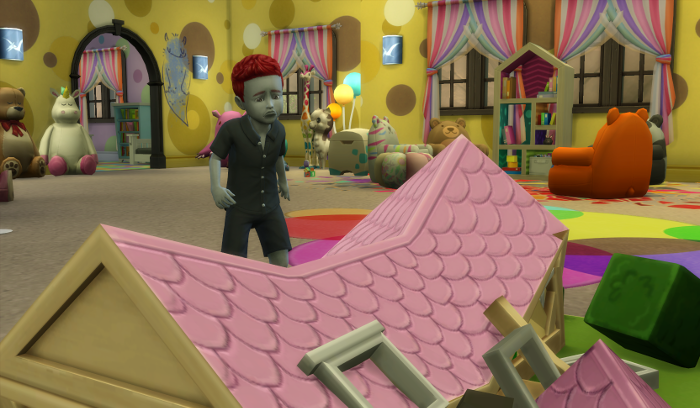 Knocking their food off their high chairs, and of course wrecking the doll house. And of course, if the kid is hungry and tired, like Cocoa here, he’ll make a mess and still be hungry. First Adam wrecks it, then he cries that it is wrecked. Oh, Adam. 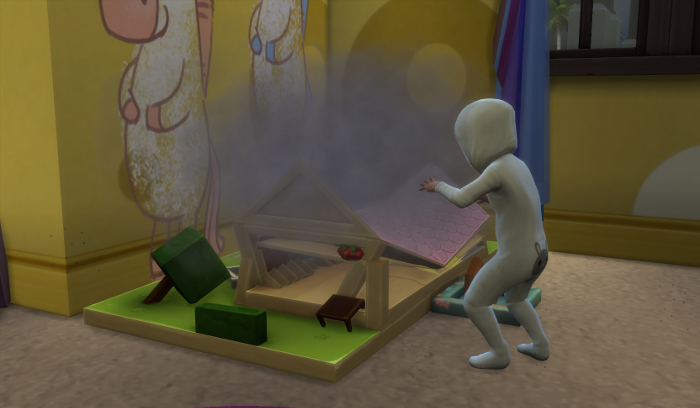 Five minutes after we fix the house, Amelia comes rushing over and destroyed it first thing after waking up. Sigh. 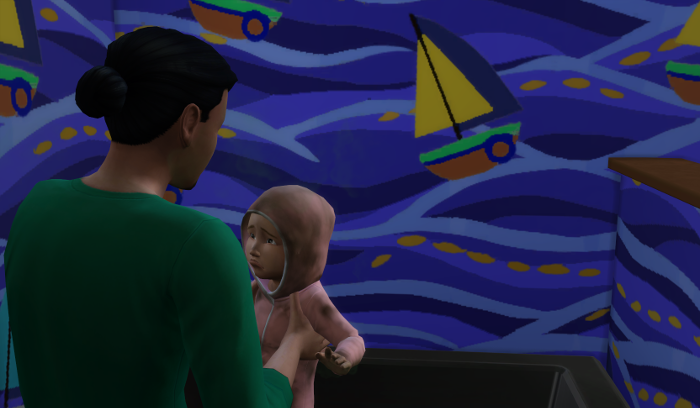 So the way to avoid angry, sad toddlers? Somethings they do on their own to help out – mainly by talking and dancing and dancing and dancing and talking. Communication was the first skill they gained and movement a close second. I swear, the third method they used was being cute. 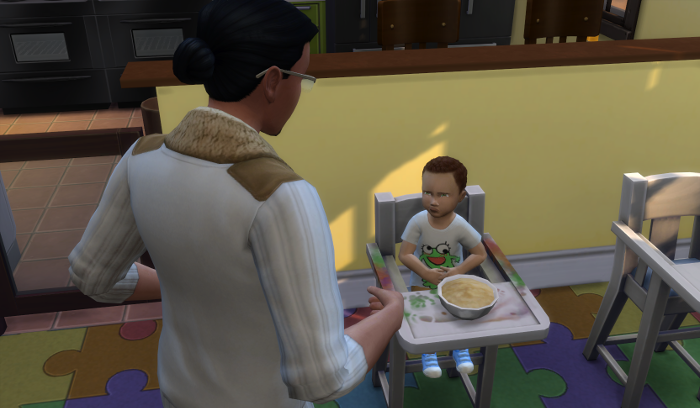 But these are toddlers, and as the game will repeatedly tell you, they are unable to take care of all their needs on their own. Attention was the killer need. So much red! We knew what to do to made them happy, it’s just Guppy rarely had the energy/time to do more than fulfill their basic needs. To make them happy, playing is A) the cutest animation in the world and B) an excellent way to up attention and fun for both toddlers and adults. Although play too long and the adult will get a sore back. But that only gets one kid’s attention and fun up. And we were often having a crisis of misery. We learned a new technique. READ to toddlers. You can read to multiple toddlers and this ups their imagination as well. Plus omg! It’s like a library story hour! 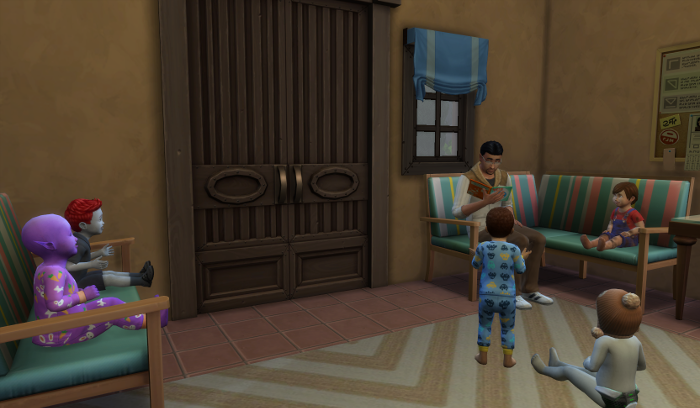 Eventually, all their frowns turned to smiles as Guppy read from the book. Guppy had been napping on the bench beforehand – that’s the only reason I can think why he decided to read here instead of next to the bookshelf. Of course, it’s hard to read when you’re faceplanting. Right in the middle of making her birthday cake too. Every once in a while, he made it to his bed. 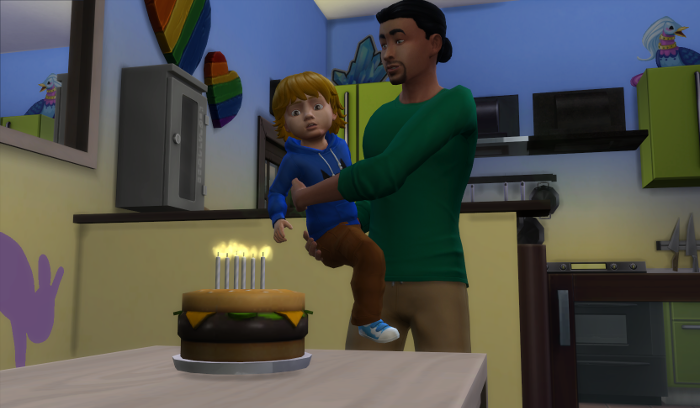 And yes, we had several birthdays – seven of them in fact, one for each of our original toddlers. Oh Sam! Why were you already halfway aged up when we started!? Julia was such an adorable kid! See?!! 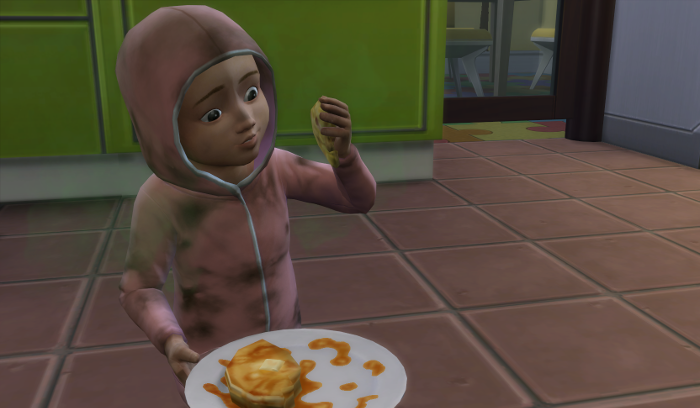 Proof she was adorable even when filthy and covered in sticky pancakes. Oops, I missed the candle blowing. Distracted by toddlers. Sorry Amelia. And then it was over. I can’t say anyone was happy at the end – we didn’t have time to do more than bathe them so they were attention-starved and hungry. And Guppy was so in the red he couldn’t even remember how to pass out. Adam. 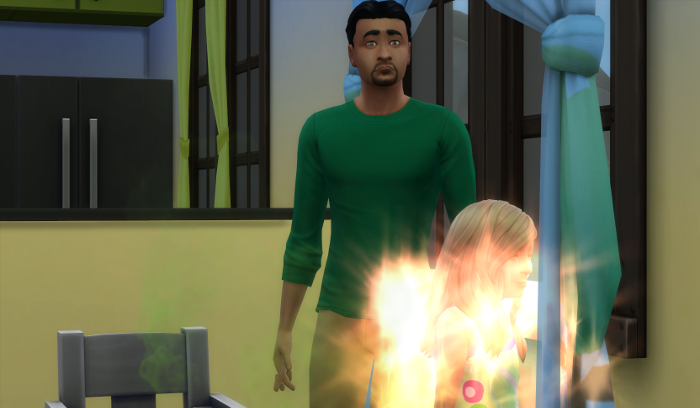 The cheater – he had a ton of traits from being a wonderchild that I think helped. Communication and Movement 5, Imagination 4, Thinking 3. Potty Trained. Raerei. I would wear that yellow onesie anytime. Communication 5, Movement 4, Imagination 2, Thinking 1 – but I potty trained myself right at the end. Enemy of Arturo and Sam Huffman. Mwhahaha. Mina – Communications master and best friend of Adam and Raerei. 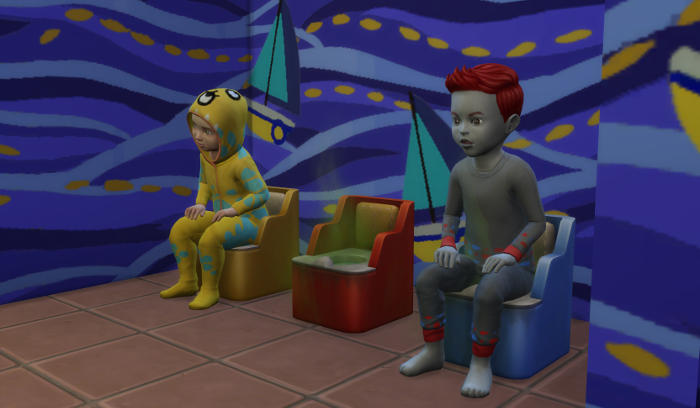 Communication 5, Imagination and Movement 4, Thinking 1 – but potty trained! Arty went last because he first had to pass out from exhaustion and then Guppy had to. It was a rough ending. Communication 5, Movement 4, Imagination 3, Thinking 2 – not potty trained. 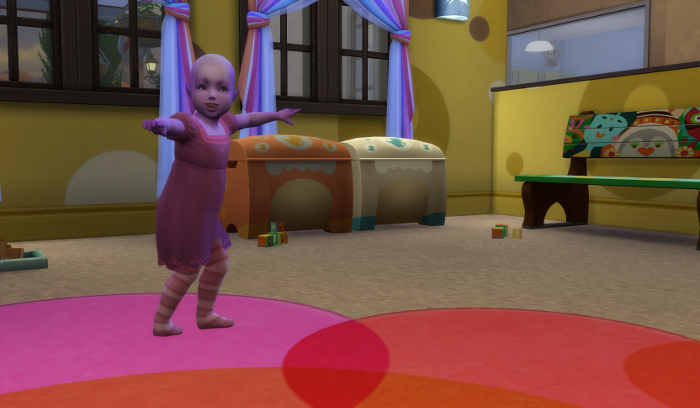 I don’t have a ton of cc for toddlers I needed hair. I recommend Lana CC finds because there’s a maxis match filter you can apply if that’s your thing. Or view only alpha hairs if you prefer the non-clay look. There are seven times as much hair there today than there was on Friday. Julia: Katarina’s hair #1 – the Short Modern. (I also used her #3 Short Straight hair on Raerei early on, but liked Synth x Lumia’s version better). Penelope had this paper boy hat, but she normally wore her animal hat. 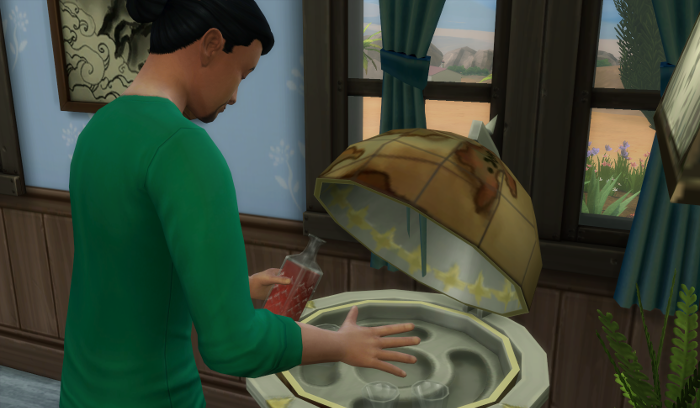 I think the only obvious piece of house cc is the vinyl stereo record player from Mod the sims. I imagine it didn’t scratch too much under all the tiny dancing feet. 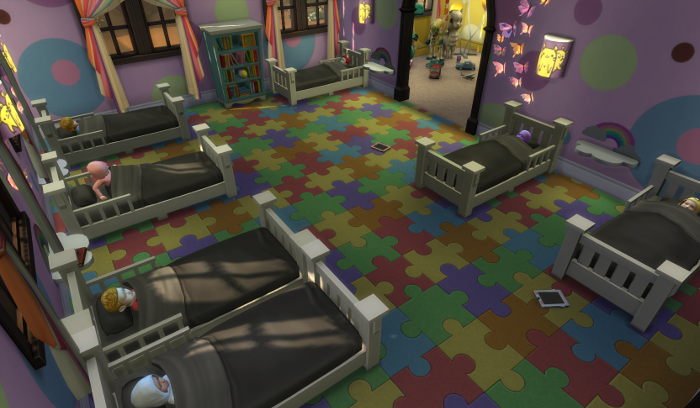 There might be rugs/walls/floors/decor/windows that are also cc peaking in a few shots- but they will be from my regular sources. Previous Previous post: What is That?! It was super fun. 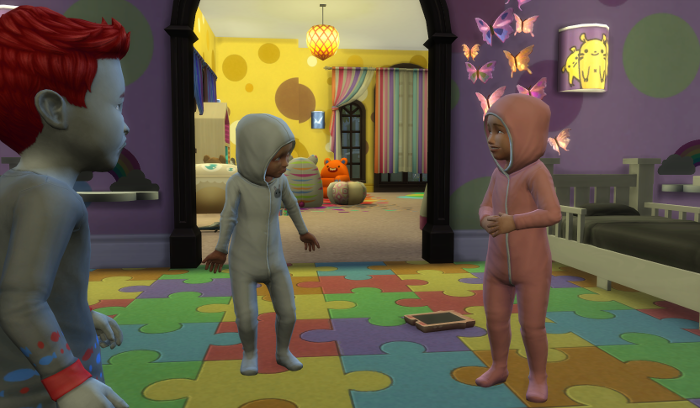 I might try it again sometime when I find more toddlers to play….and after a long break. So much fun! Penelope and Mina made me Awww each time I saw them! And Cocoa! What fun! I have to say it was a ton of fun playing those little faces. They look so much like themselves! 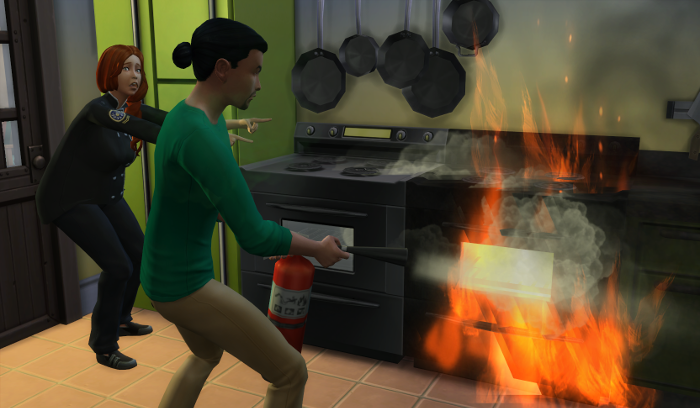 I just wish my simself had been less angry, I could have made more friends! But alas it was not meant to be. 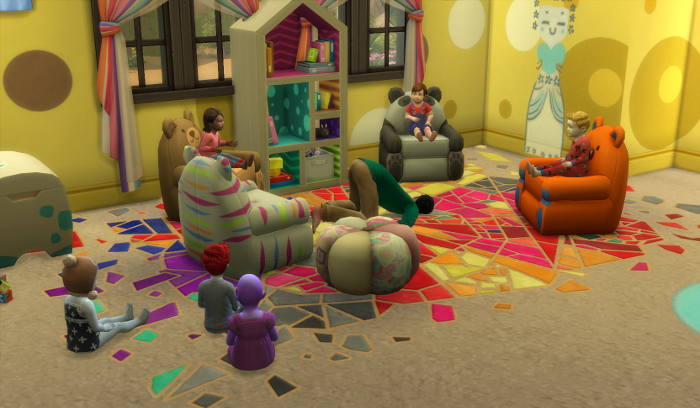 SEVEN toddlers! Wow. I can’t believe how adorable they look when they’re taking a nap. 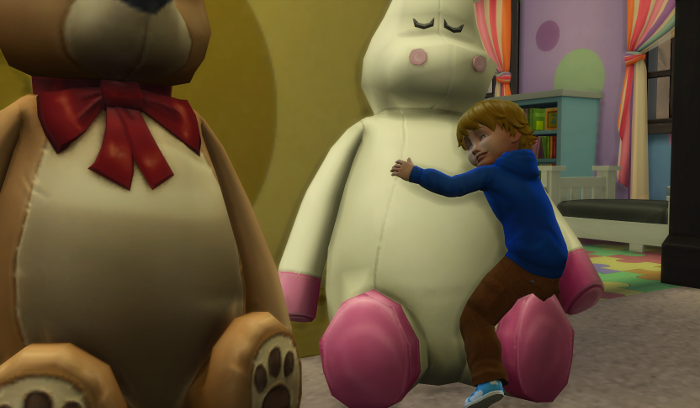 They seem just as cute as they were in ts3! They are really fun to play. Even when they cause sleeplessness. 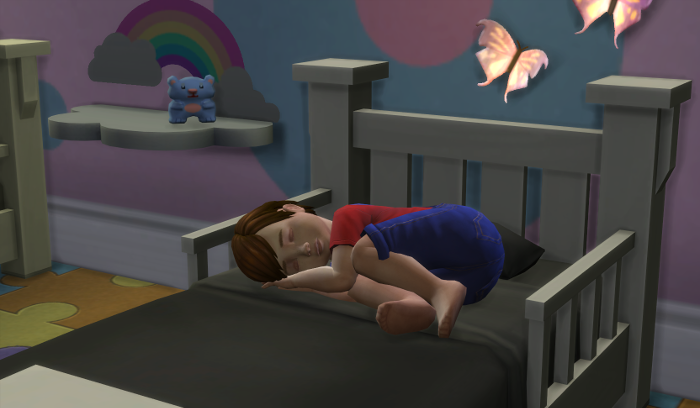 I loved how toddlers used to nap in pet beds, but the nap here is just all cute and curled up. I know. I don’t know how he made it! I’ll have to be extra nice next time I call on him for a challenge. It was pretty fun if rather insane. Next time I’m hiring a butler or nanny though!